Considering BOP As Partner And Not As Consumer | Business Article | MBA Skool-Study.Learn.Share. 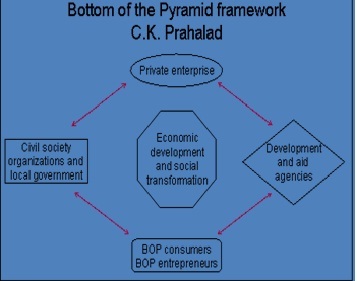 The Bottom of Pyramid, as defined by Prof. CK Prahalad, considering economic pyramid, constitutes of the 2 billion people worldwide living on less than $2 per day. In last decade the companies operating in India have laid importance to serving this section assuming to raise revenues through selling low margin products in high volumes. For this the companies started launching their products in small sachets with reduced prices, but the issue is have they realized the profit they assumed? The bottom of the pyramid is crowded, and more than a little discouraging. At less than $2 per day, life is mostly about subsistence poverty. It is about barely having enough food to eat and about inadequate health care. It was about not being able to educate some or all of the children in the household. It is about having no savings. It is about inadequate shelter for one’s family. It is about no fallback or cushion if crops fail. It is about having no contingency funds for emergencies. It is about having almost no ability for any kind of discretionary spending. In short BOP is hand to mouth. Coming to the point rose by Prof CK Prahalad that the companies should treat the people at the base as customers. As customers, our intent should be to offer them affordable income opportunities which allow them to sustainably move beyond the subsistence space to that first level of prosperity. This is a very welcome idea which aides improving their standard of living and exposing them to various new products and services. But considering them only as consumers can lead to loss of opportunity by not utilizing their other potentialities. As per a report by NIC (National Informatics Center) the unorganized sector which is dominated by low income group people account for about 60% of net domestic product, 68% of national income, 31% of agricultural exports, and 41% of manufacturing exports. Thus, more than just being consumers, this workforce, which mainly consists of hawkers, construction workers, domestic helps, road-side mechanics, scrap workers, etc these have potentials to be facilitators and partners. For instance the road-side hawkers have ground level experience of selling various products, so by providing some vocational training they can become powerful resources for FMCG companies. The real “fortune” of BOP lies not merely in serving these low-income markets, but in organizing and unleashing the under-utilized entrepreneurial potential of its inhabitants. For instance, Sri Mahila Grih Udyog (more popularly known for Lijjat Papad) mobilized the grass-root entrepreneurship of women into organizing them into a Rs. 312crore business. Today’s bottom of Pyramid is very much connected through mobile phones and television. The press release by Telecom Regulatory Authority of India states the Tele-density has touched 72.08% in April 2011, the major contribution of which has come from rural area. Still, the business ecosystems needed to support a product or service is often missing at the bottom of the pyramid. Innovative companies address the holes in the ecosystem by supplementing value chains end-to-end. For example, Amul, an Indian company that buys milk from 3 million dairy farmers, arranged for artificial insemination services for its small producers. Another such initiative is taken by Coca-Cola, which has created manual distribution centers, known as MDCs. These MDCs have proved as an effective means of getting soft drinks into hard-to-reach urban areas in emerging markets, where infrastructure is poor and volumes are relatively low. Coca-Cola did not just organize and recruit entrepreneurs to run these centers but has also filled all the gaps along the value chain. Distribution-center owners take responsibility only for logistics and fulfillment. Coca-Cola handles such tasks as marketing, supply monitoring, and order taking. Similarly other companies can benefit by considering BOP not only as their customers but also as potential partners or producers. The corporate have realized that, financially sustainable and integrated BOP business lines are the superlative of truly sustainable and strategic Corporate Social Responsibility be it e-choupal by ITC or the ‘Shakti’ initiative by HUL. Partnering the bottom of the pyramid may be the key to ushering in a new era of capitalism which generates profit, offers wealth-creation opportunities for the poor, spreads products to reduce sickness and spreads education around the world – welcoming billions of people to participate in a more inclusive, sustainable global economy. These little fires lit by corporations, entrepreneurs, academics, governments and non-profits may yet become a blaze that will change the world. This article has been authored by Ashish Agarwal, FMS.